The headlines from yesterday’s Autumn Statement were mainly about the grim economic forecasts, post-Brexit. But there were also some significant developments around the Northern Powerhouse (see my paper on the topic). There had been concerns that this agenda was going to end when George Osborne, who led it, left the Treasury. Yesterday’s announcements suggest there is life in the agenda yet. While there was little new money, the government did publish a Northern Powerhouse strategy – a cheap way to confirm ongoing interest. The strategy suggests some shift in focus. Under Osborne the Northern Powerhouse had four "ingredients" - transport, science and innovation, devolution, and culture (the poor relation). The new "strategy" seems based on: connectivity, skills, enterprise and innovation, and trade and investment. Culture is now justified mainly as an attempt to attract and retain skilled workers. Second, the initial focus on innovation has broadened out to include enterprise. While few people are against enterprise, many firms are not the wealth creator politicians imagine (see Alex and Paul’s work here) and there are cautionary tales about the creation of lots of poor quality start-ups in lagging regions. The focus needs to be on quality, not quantity. Finally, one critique of the Northern Powerhouse has been that it is a political brand rather than a genuine economic strategy. But the branding element is now an explicit goal of the policy (see this whizzy video), with the aim of using the Northern Powerhouse branding to attract trade and investment. Given the state of the post-Brexit economic forecasts, let’s all hope this works. Earlier this month, the government gave approval for exploratory drilling and hydraulic fracturing – ‘fracking’ – for shale gas at two sites in Lancashire. This follows a similar decision for North Yorkshire earlier in the year. Some will see these as landmark planning decisions marking the way to a low-cost energy future for the UK, with shale gas becoming a major new source of energy in countries across the globe. For others, particularly those who live locally, they will be seen as leading to potential environmental catastrophe. These fears are fuelled by many reports from the United States about the risks associated with shale gas extraction by fracking – water contamination, earthquakes – plus concerns about the local impact of traffic and extraction infrastructure. Our recent research investigates whether these fears affect what people are prepared to pay to live in areas affected by fracking, by tracing out the impacts of shale gas licensing and exploration on house prices in England and Wales. Although commercial shale gas development has not yet taken place in the U.K., exploration licenses have been offered since 2008 and many exploration wells have been drilled. Our findings suggest that this licensing and exploration in itself had little or no impact on house prices throughout most of England and Wales. See the map below for licensed areas. Note: The map shows blocks that were licensed for gas exploration in the 13th round in 2008 (red) and previous rounds (blue). Grey shaded areas have shale gas potential according to the British Geological Survey (BGS). The one exception is the one site in the UK where exploratory fracking for shale gas has taken place (shown as a red dotted area in the North West on the map). Here we find that prices fell by up to 5% after fracking commenced. A specific trigger for this was the occurrence of two highly publicised earthquakes in 2011 which were linked to the fracking. 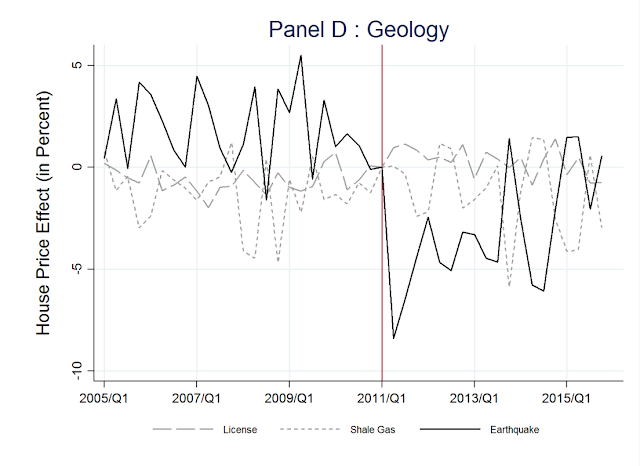 What happened is illustrated succinctly in the Figure below, which plots the trend in adjusted house prices at quarterly intervals up to and after the earthquake event in 2011. 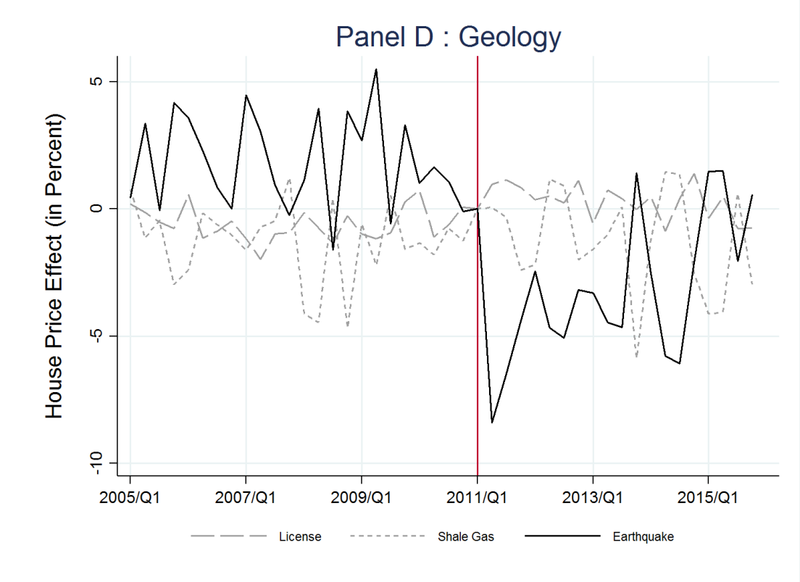 The solid line represents the earthquake zone, while the dashed lines show trends in other licensed areas and where licenses specifically mention shale gas. In this picture, prices are scaled relative to the beginning of 2011. Clearly there was quite a marked fall in transaction prices in the months after the fracking and earthquake event. These earthquakes were minor and would not have caused personal injury or damage to property. So the most likely explanation for any impact on house prices is that the earthquakes reminded people of the potential risks, and so reduced demand for homes in the vicinity. The implication is that there are ‘psychological costs’ associated with fracking, which should be compensated. An existing industry Community Engagement Charter already recommends payments to local communities by drilling and exploration companies, of around £100,000 for exploration, plus 1% of revenues during extraction. The government has recently consulted on a new Shale Gas Wealth fund that proposes using 10% of revenues from shale gas to fund payments with a maximum of £10 million per site, to communities and individuals affected by extraction. But aggregate costs per site implied by the house price reductions are far in excess of these – over £100 million! Compensation to communities could prove to be very costly, if local objections to fracking are to be overcome by those who see fracking as the answer – at least in the short term – to securing Britain’s energy.